Set sail for the adventure of a lifetime aboard one of the ships in the race, rise to the challenges faced by the crew every day, and meet people from around the world! ANYONE CAN BECOME A TRAINEE! All you need is the spirit of adventure and love of travel. Whilst the aim of the event is to primarily attract young people aged 18 25 years old, it is open to all ages. If you are young at heart you can join the crew. No experience necessary! This depends on how much time you have and on your budget. You can choose a short cruise on the St Lawrence River or join the crew on a tall ship for the length of the race! YOU CAN CHOOSE WHICH SHIP TO HAVE YOUR ADVENTURE ON! Berths are filling, but you can see which ships still have availability on sailonboard.com. You can book directly with the ship or if you need help go through our booking agent at www.windseeker.org. IS THERE MEDICAL AID AVAILABLE ON THE OPEN SEA? There is an officer onboard ship who is specially trained for medical emergencies. The ship is equipped with a first aid kit and a satellite radio to call for medical aid from the navy. As a sailing trainee, you will face a variety of challenges depending on the size of the ship. 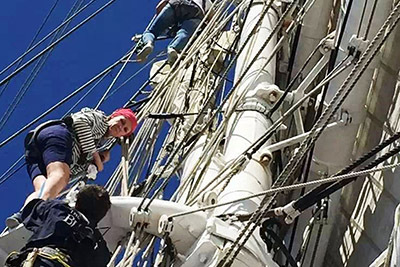 You will take part in all the tasks of a crew member on a tall ship. But above all, you will discover your hidden strengths and talents and experience all the joys of working as a team! Cost varies depending on the ship you sail on and the length of the race leg i.e how many days you will be on board. There are lots of special offers being made available now the Regatta has started, as well as bursary support. The latest prices can be seen on the ship websites, or by contacting the booking agent at www.windseeker.org. Bursary information can be seen at www.sailonboard.com. You don’t need to be accompanied. Trainees who are 15 to 18 years old are assigned to a mentor who they can turn to at all times. The parents of trainees will be able to contact a resource person in our organization at all times for news of their child. If you have any queries or difficulties, please contact us at: trainees@rdv2017.com or enquiries@sailonboard.com.